Tissue banking can be defined as a collection of various tissues such as blood, bone, heart valves, skin, cornea, blood vessels, soft tissues and so on from donors, which are further harvested, sterilized, processed and preserved by placing under appropriate storage conditions for use during surgery or medical research. Tissue banking is a novel way to treat several chronic diseases such as blood and immune disorders. Tissue baking also plays an important role in the development of regenerative medicine. Regenerative medicine involves repair and regeneration of cells, tissues and organs disease which are affected by diseases, trauma and aging. For instance, stem cells have the ability to differentiate into specialized type of cells which are used in the treatment of various diseases. Hence, the collection and storage of cord tissue is gaining popularity due its rich source of stem cells. What are the major applications of Tissue Banking? Canadian parliament has announced an investment of $2.5 million for dementia research as more than 400,000 Canadians aged 65 and above is diagnosed with dementia and Alzheimer’s. The funding includes 1 million dollars to establish Canadian brain bank network that will be linked to the international Alzheimer’s disease Neuroimaging Initiative. The funding will more broadly support brain donation and tissue banking for dementia research programs in Canada which would make way for regenerative and personalized medicine. Several researches are under progress to better understand the role of mesenchymal stem cells in treating diseases such as Parkinson’s, autism and type 1 diabetes. For instance, human umbilical cord tissue-derived mesenchymal stromal cells are being administered every two months in children with Autism to determine the safety of one, two and three intravenous infusions through clinical trials. 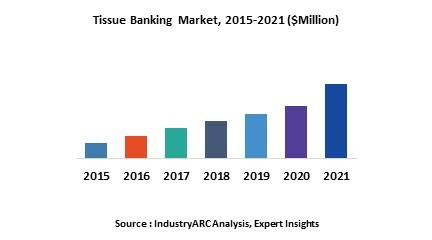 The tissue banking market is growing tremendously as several companies are providing various kinds of tissues for research and surgeries. One such company is RegenMed, which is an established company providing musculoskeletal products like bone and connective tissue, or allografts, for use in transplants. Recently it announced that other tissues such as heart valves and skin for burn surgeries will also be processed in and distributed. Thus gaining a wide market in Canada and U.S.
Statline developed StatTrac, a software that captures the donor’s information. The API provides real-time access to StatTrac referral data and easy integration of that data into a variety of software systems. This information allows OPOs, tissue banks and eye banks to streamline their processes and make faster decisions within the donation process to save and heal more lives. Who are the Major Players in Global Tissue Banking market? The companies referred in the market research report are CCLG Tissue Bank, Taylor-Wharton International LLC, Tecan Group Ltd., BioCision, LLC., Thermo Fisher Scientific Inc., Cureline Inc., Tissue Banks International, Eppendorf AG, Brooks Automation, Inc. and several others.